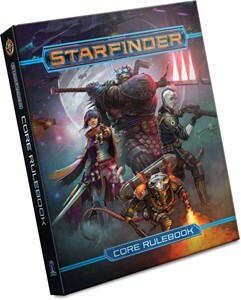 This massive 560-page hardcover rulebook is the essential centerpiece of the Starfinder Roleplaying Game, with rules for character creation, magic, gear, and more—everything you need to play Starfinder as either a player or Game Master! 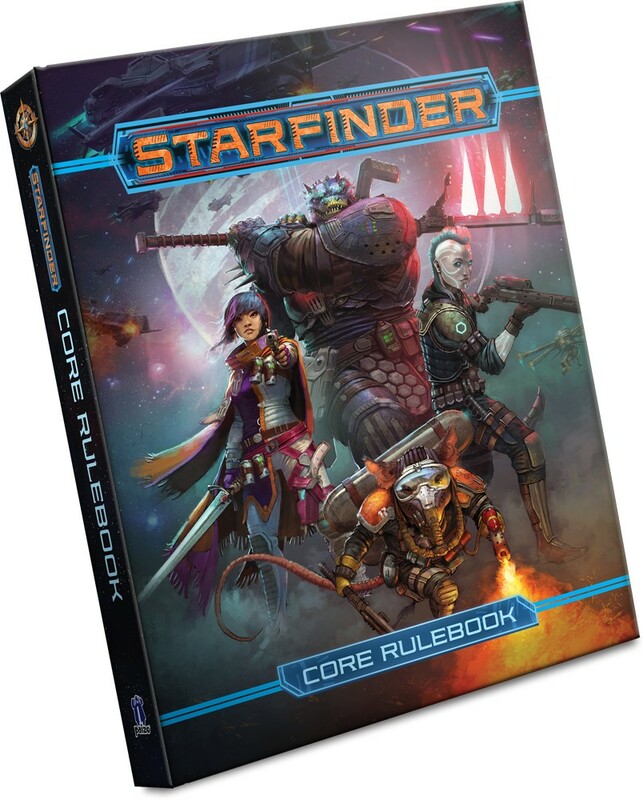 The next great adventure in science-fantasy roleplaying takes off here, and the Starfinder Core Rulebook is your ticket to a lifetime of adventure amid the stars! All player and Game Master rules in a single volume. Complete rules for science-fantasy races like logical androids, telepathic lashunta, ysoki ratfolk, and more—plus all of the classic fantasy races of the Pathfinder Roleplaying Game! 7 new science-fantasy classes, from the spellhacking technomancer to the starship mechanic with a remote-controlled robot. Will you be a heavily armored soldier, a charismatic envoy, a stealthy operative, an occult mystic, or the cosmically attuned solarian, who calls forth strange powers and shapes energy weapons from stars and black holes? A detailed overview of Starfinder's core setting, including the planets of the Pact Worlds, their gods, major factions and threats, and more. Complete rules for starship combat, as well as for building and customizing your starship. Hundreds of science-fantasy weapons, armors, and items, both magical and technological, from plasma cannons and holy power armor to enchanted swords and cybernetic implants. Hundreds of spells to let your mystic or technomancer tap into esoteric energies and rewrite the laws of physics. Rules for alien environments, deadly traps, bizarre diseases and poisons, and everything else you need to craft exciting adventures. Advice on converting Pathfinder RPG content to Starfinder, and vice-versa.